1. Join Leaders in Energy here. This will add you to our mailing list so you can receive our latest news on our events, workshops, job announcements, blog articles, and other clean energy and sustainability topics. This is currently no charge to be a Leaders in Energy member. Leaders in Energy, a nonprofit organization, has attracted 4500+ members (including its Leaders in Energy Research, Communications, Policies, and Analysis (LERCPA) LinkedIn group ). 2. Join our group on LinkedIn to connect with 3100+ clean energy and sustainability professionals in the Washington DC area, the US, and in over 100 countries. (Click here to join as member; “Leaders in Energy Research, Communications, Policies & Analysis LinkedIn Group”). This forum provides for the exchange of knowledge among practitioners and those who are passionate about these issues. –Join our Leaders in Energy organizational page on LinkedIn to keep posted on our program and activities here. –We also have a growing Facebook group which you can join here. –Follow us on Twitter @LeadersinEnergy to connect with other current and aspiring leaders and professionals and provide you with increased professional visibility. –Join us on Instagram here. SHARE information on clean energy and sustainability topics and meet others around the DC area, US, and globe by participating in our lively on-line discussion forum in our Leaders in Energy group on LinkedIn as well as join our organizational company page – Leaders in Energy on LinkedIn. Have your company SPONSOR an event and gain key visibility as a leader and expand opportunities to connect with our LE community to expand your business or consumer markets. 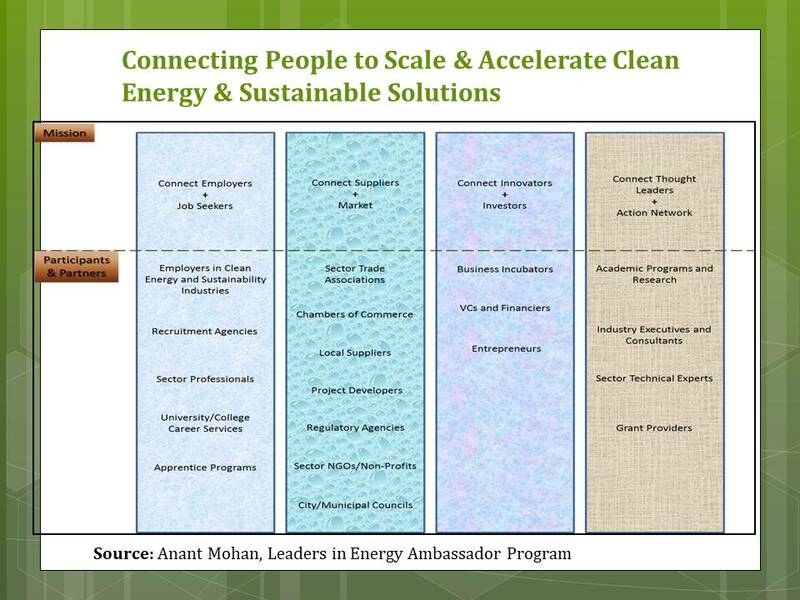 Have your company or organization become an ORGANIZATIONAL PARTNER in developing synergies to further advance clean energy and sustainable solutions. Network with other leaders and professionals with similar strategic interests. See the diagram below with examples of our member and stakeholder community. During the past years, we have seen tremendous growth in our organization. We have over 3,000 members from around the world in our group on LinkedIn. In addition, Leaders in Energy has approximately 1,500 members on its mailing list in the Washington DC Metro area. The group develops and exchanges information and ideas through its educational and professional networking on-line and in-person events on energy, environmental, and sustainability topics to enable and create a sustainable energy system, economy, and world. Our members hail from Washington DC, other parts of the United States, and many other countries around the world. Conduct professional and educational networking events in addition to workshops involving, e.g., hands-on/real world. We have conducted several workshops on the Circular Economy including one at the Alexandria Renew wastewater treatment plant and most recently at the University of District of Columbia (September 2017) to develop an Action Framework for the Circular Economy in the Washington DC region in addition to our ongoing Circular Economy Working Group which meets every fourth Wednesday of the month. Learn more here.